What is the very best way to clean a dog bed when you can't remove the cover? The American Pet Products Association estimates that owners will spend over $62 billion on their pets this year, with nearly $20 billion going to medicines, supplies and veterinary care alone. So we do not just love our dogs, we take good care of them too. However, there is one spot in caring for our dogs that is routinely overlooked, and it is a spot where they spend a lot of their time -- their beds. Dog beds are often forgotten until our noses can no longer ignore them. However, waiting until your pooch’s smelly dog bed demands attention just make them harder to clean, and it may not be the best thing for your dog either. So we should all be cleaning our dog beds more often. Of course, some dog beds are easier to clean than others. Small beds with removable covers are certainly the easiest. 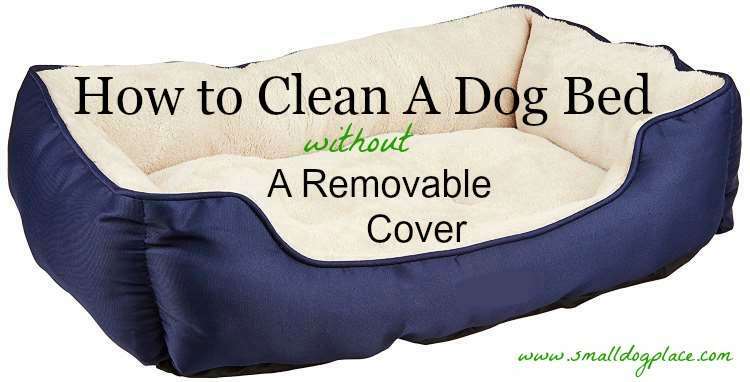 However, many cheap dog beds do not have covers, but those need to be cleaned regularly as well. So what’s the best way to wash a dog bed without a cover that’s also safest for your dog? Here are some suggestions to get that stinky dog bed clean and smelling fresh, and keeping it that way, while keeping your dog feeling good. 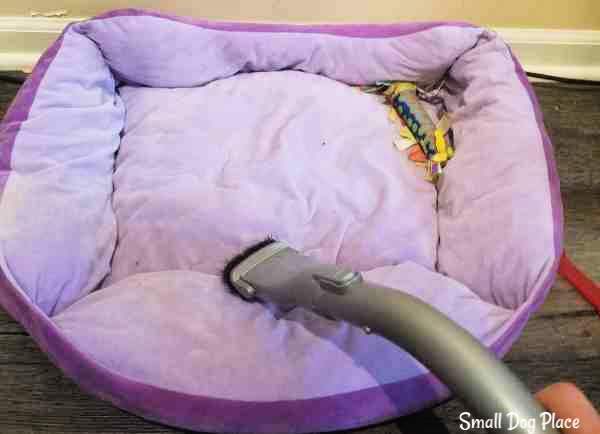 Vacuum the dog bed before washing to remove any dirt. Before applying any liquid to the bed, to clean a dog bed, run your vacuum over it a few times to remove all the loose hair and dander that inevitably collects there. Vacuuming can also remove unhatched eggs from fleas and other insects. To get everything, try running a lint roller over the bed after vacuuming. Don't neglect the corners where hair and other debris tend to accumulate. The Rocco & Roxie Professional Strength Stain & Odor Eliminator - Enzyme-Powered Pet Odor & Stain Remover for Dog and Cats Urine may work when nothing else does. This product can be used on most surfaces. This is my Number one Choice for removing odor and stains. Nature's Miracle Stain and Odor remover is one of many products available under the Nature's Miracle Trademark. It is an enzyme cleaner that works similar to other enzymatic formulas that break down and remove stains. This one can be used around pets with no ill effects. I like the light citrus scent which works well on pet odors. As the name suggests, this will removes the stains and odors at the molecular level. Rather than adding a pleasant scent, this product neutralizes the odors and destroys any odors. I've noticed that the odors remain gone even after days after application. The packaging suggests that the product works equally well on any organic compounds including vomit, feces, pee whether originating from pets or human. This makes this product very useful not only for dogs but can also be used to clean bathrooms. What sets this product apart is the lack of artificial fragrances. Make sure to use a non-bleach cleaner on the stains, which can be found at most pet supply stores. If for some reason you do not have the option of using a non-bleach product, definitely avoid products with chlorine. Treat the stains as directed, and rinse the bed thoroughly several times. Squeeze out as much water as possible, and repeat several times before moving on to washing. 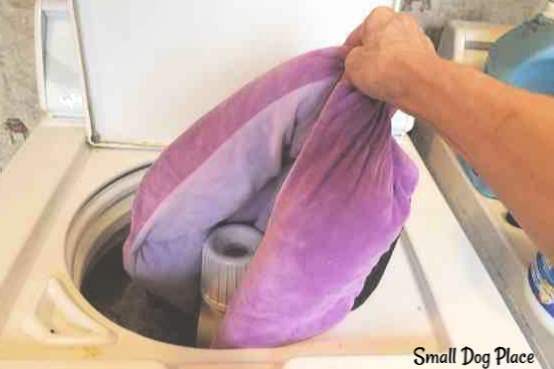 If it is small enough, place the dog bed into a washer. When you clean a dog bed, make sure to read the instructions on the tag of your dog bed for the manufacturer’s recommendations for how to care for it. Assuming it complies with the guidelines, and if it fits, put the bed in your washing machine and wash it in hot water. If it has been a while since the last time you cleaned the bed, you may want to run it through the entire cycle twice. If the bed is too large for your washing machine, you can take it to a laundromat and use an extra larger washer, or wash it by hand in your bathtub. If you choose to wash the bed yourself, first, fill your bath tub with hot water. The hot water will kill any remaining insects and eggs remaining on the bed. Pour a capful of mild detergent into the water, then add a 1/4 cup of apple cider vinegar or white vinegar. The vinegar is a very effective deodorizer, it is much cheaper than most commercial products, and most importantly, it is also safe for your dog. When choosing the detergent to use, make sure to pick a pet safe detergent. Harsh commercial cleaners can be very irritating to a dog’s skin, and some can even be toxic. When the water is ready, put the bed in the tub and make sure the water covers it completely. Then let it soak for at least 15 minutes. After the bed has soaked, drain the water from the tub, then squeeze out the water that’s accumulated in the foam filling. Rinse the bed thoroughly with warm water, then squeeze out that water as much as you can. Repeat the rinsing process several times, making sure that there are no soap bubbles in the water that you squeeze out. Ensure that you have gotten as much water squeezed out of the bed as you can. Then, if it fits, throw the bed in your dryer and dry thoroughly. If the bed is too large for your dryer, and if the sun is out, leave the bed outside and let it dry. You can also place the bed near an indoor heater, but keep the bed at a safe distance and don’t leave it unattended. Make sure you dry the bed completely so that no mold will grow within the foam. Voila! The bed is clean, the smell is gone, and you can rest easy knowing your dog is sleeping safely. Between washes, take these steps to maintain the bed as clean as possible, to make washing easier. Put a comfortable blanket over the bed, remove it regularly to launder. Occasionally wipe down the outside of the bed with an 8-to-1 mixture of water and apple cider vinegar. If it is small enough, enclose it in a large garbage bag and then place the bed with the plastic bed in a pillow case or cover completely with a blanket of sheet. Use an 8:1 solution of water and apple cider vinegar to refresh between laundering. The single easiest way to keep your dog’s bed cleaner longer is to keep your dog clean. After all, he is leaving the dirt and hair on the bed. Make sure to bathe your dog regularly, and keeping your dog’s bed clean will be much easier. Take these simple steps to make sure your dog’s bed is clean, and your dog will sleep healthy and happy for a lifetime. 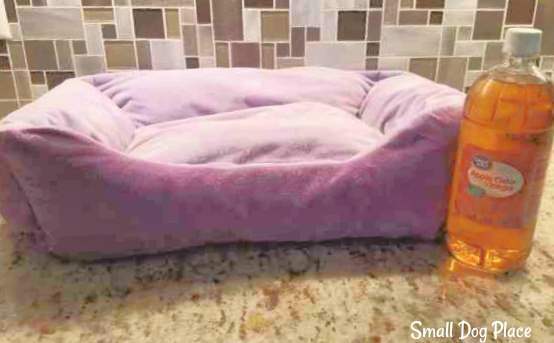 How to Clean A Dog Bed Without a Removable Cover was writen by Kimberly Leslie Kimberly is a Writer, blogger and pet lover. Love to share what I experience with my pets. It is fun!